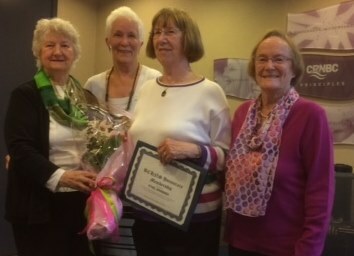 APRIL 13/17 The BCHNS held its AGM and the Officers for this year were presented. President: Kathy Murphy, Vice President: Sally MacLean, Treasurer: Sue Forshaw & Secretary: Lynne Esson. Sally is the new member on the executive and we are happy she was willing to fill that vacant position. The highlight of the evening was the presentation of Honourary Membership status to long time member Ethel Warbinek, who had been nominated by Glennis Zilm & seconded by Nan Martin. Her page will be added soon to the Honourary Members section of this website.